If you have not been to Relish Café & Bar, then you’re seriously missing out. You really need to go. Now. I promise. Relish opened in April 2011 and prides itself (rightfully so) by offering new Southern-style comfort food — classics with a modern update. There are a number of reasonably priced and quite tasty appetizers, sandwiches and entrees that I’m pretty sure you will not find in any other Triangle restaurant. Relish’s atmosphere, service and, most of all, food are great. It is right around the corner from where I work, so it’s a wonderful place for me to dine in or grab some take-out for lunch, or to meet friends after work for drinks and/or dinner. 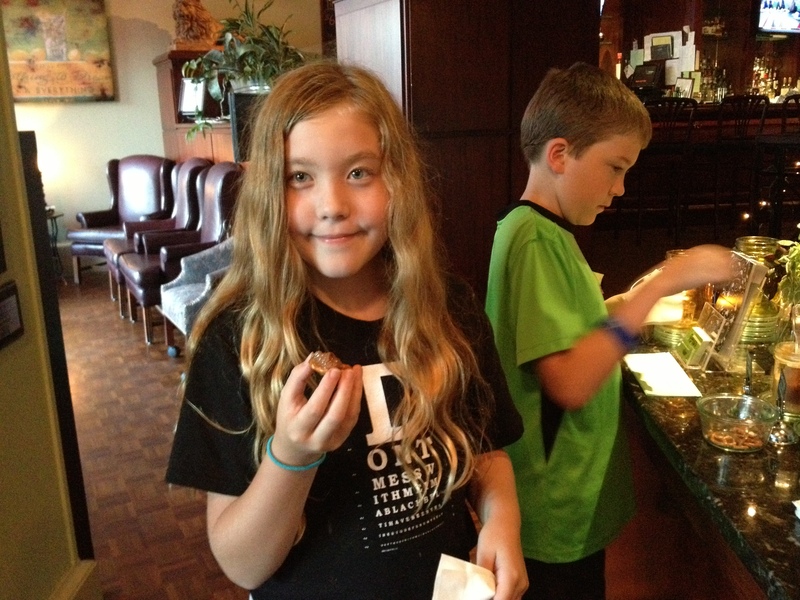 And it is one of Gabe and Lexi’s favorite restaurants, probably because of the tasting bar of salsas and dips, the Mac & Cheese skillets and especially the warm and delicious doughnuts with yummy chocolate and raspberry sauces for dipping! Pimento cheese, as an appetizer with homemade crackers ($6.50) or as a sandwich ingredient. 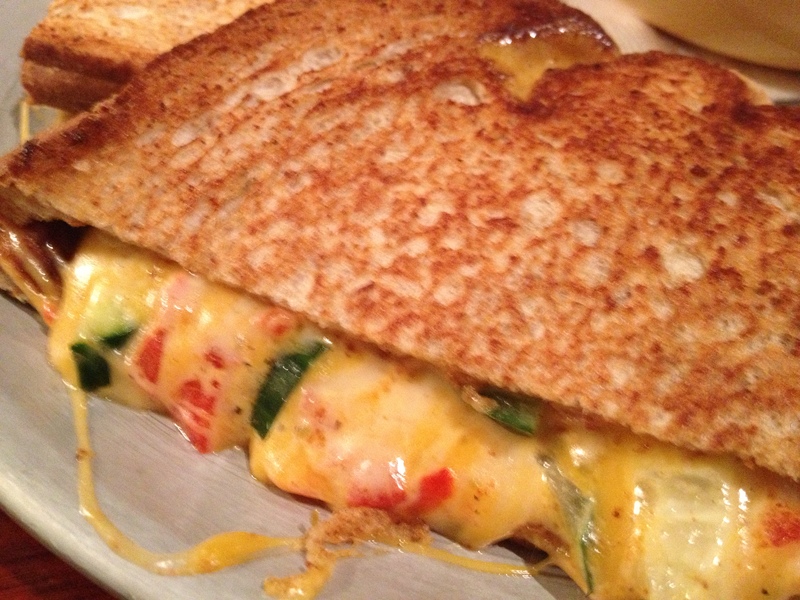 Pictured here is the Vegetarian Grilled Cheese ($8.50) and comes with homemade potato chips or steak fries. Homemade potato chips – Yum! These are light and crispy, and come with most sandwiches or as an appetizer with ranch dressing or comeback sauce ($5.50). 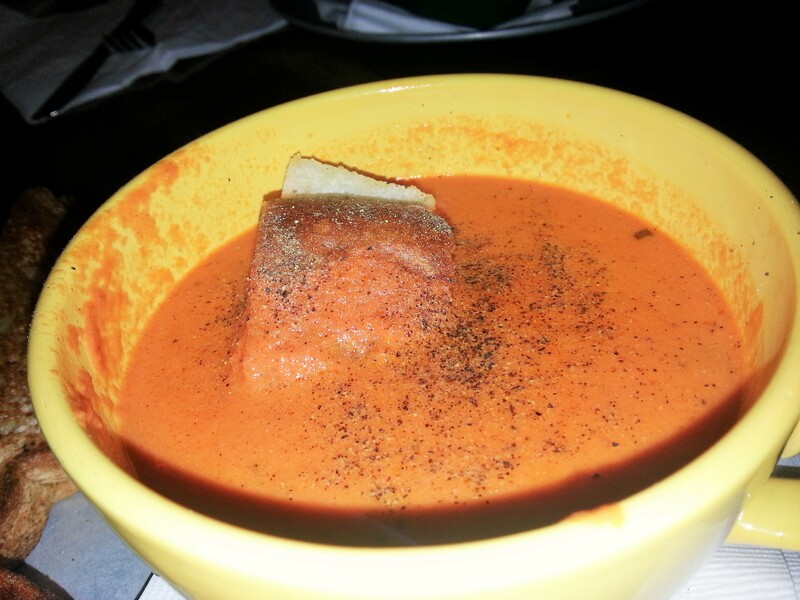 Tomato soup — it truly is a mug of comfort ($5.00). That giant crouton is so good! 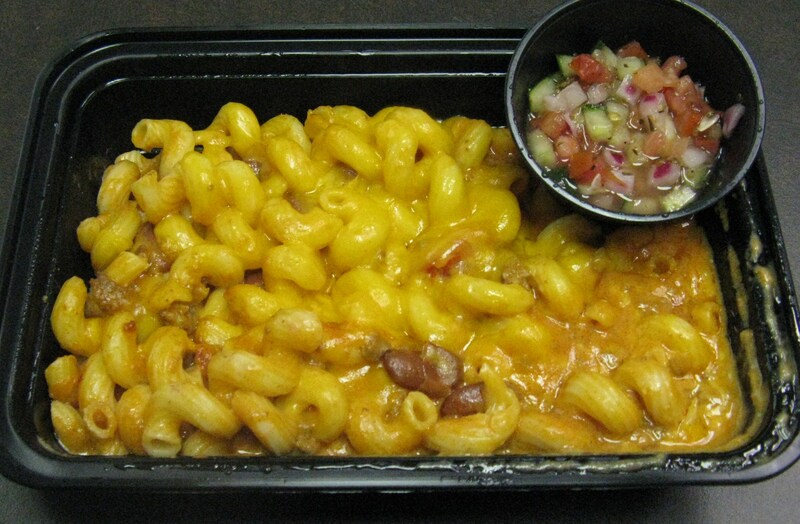 Mac & Cheese Skillets — I’m particularly fond of the Italian Mac ($9.00) and the Chile Mac ($9.50). 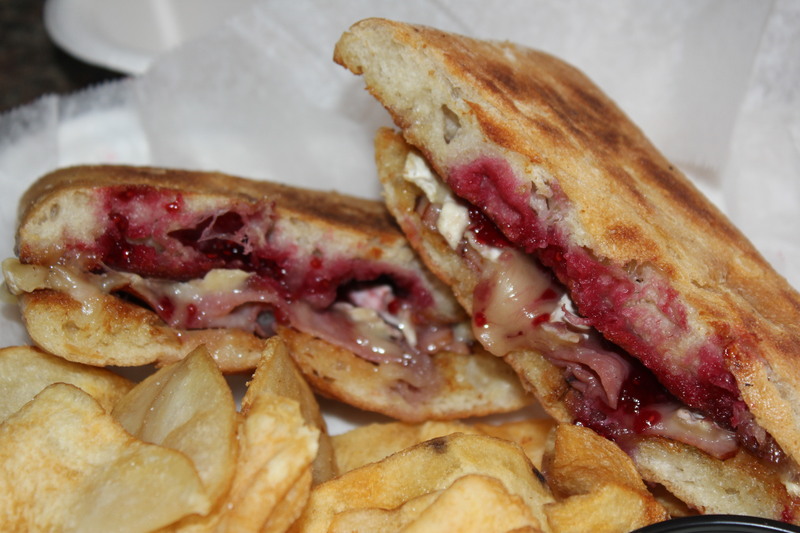 Grilled Cheese — I’ve tried the Big Cheese, which has fried green tomatoes ($9.00); the Parisian, pictured below with brie, ham and raspberry preserves ($9.00); and the Vegetarian, which has pimento cheese, cukes and roasted red peppers ($8.50). All are awesome. They all have lots and lots of cheese, so of course they are. 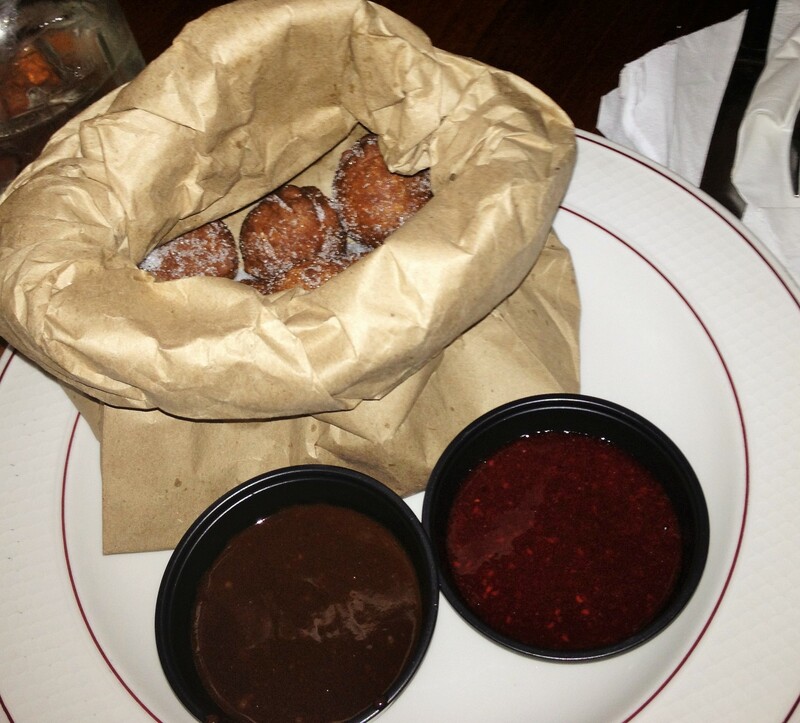 Doughnuts — These are fried, sprinkled with sugar, served in a paper bag with chocolate and raspberry sauces ($5.00). A must-have dessert at Relish! Other great choices include the pimento cheese fritters with pepper jelly ($7.50), fried green tomatoes ($7.50), Cobb salad ($10.00), California turkey wrap ($9.00), tuna melt ($9.50), and the black and bleu burger ($9.50). 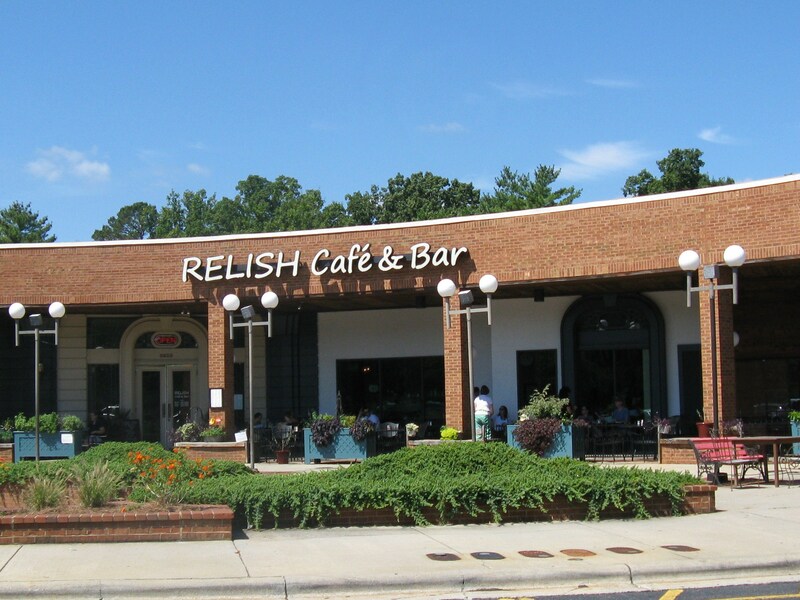 Relish Café & Bar is located in the Creedmoor Crossings Shopping Center, which is at the corner of Millbrook and Creedmoor Roads. It is open 7-days a week for lunch and dinner (brunch on the weekend) — check its website for hours. Parking can be an issue at lunch, since it’s a popular place in a popular strip mall. My advice — go early or go late. Just go! And please invite me to come along. Price: The price is nice. Be sure to check out the daily bar specials. Service: 4.50: Friendly and efficient, although the bar can be slow at times if there’s a crowd. 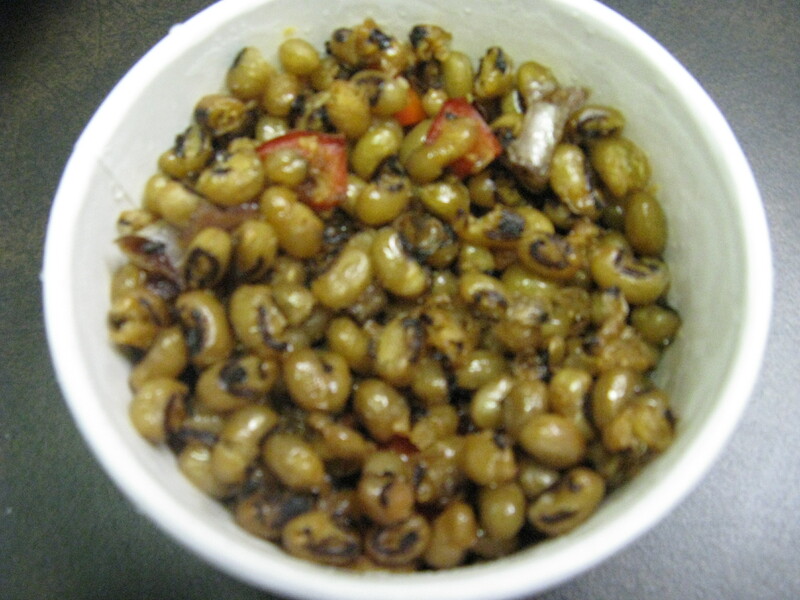 Food: 4.75: Southern comfort food with a modern slant. Many unique items on the menu that you will not find elsewhere. Recommend: Absolutely. Excellent food, atmosphere and service is why I keep coming back. Kid friendly: Oh yeah! 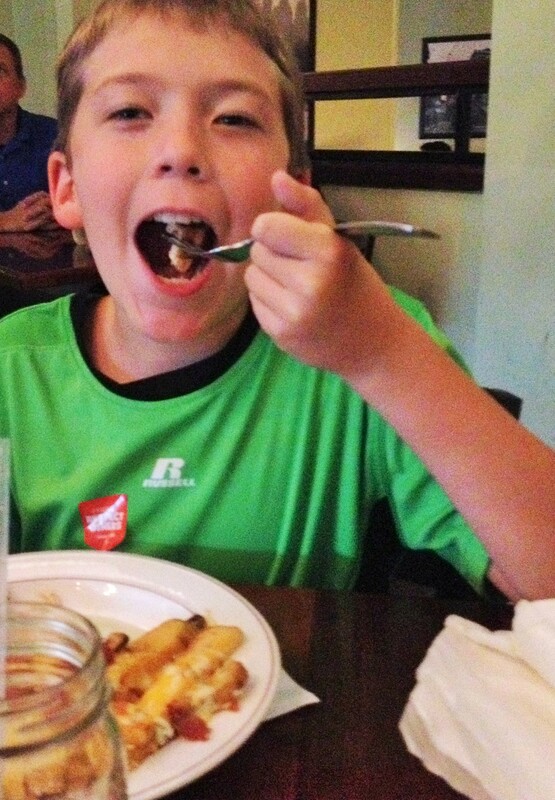 There are a number of kid’s plates with typical kid food (chicken fingers, burgers, grilled cheese, etc.) plus a farm-fresh side and drink for $5.00. 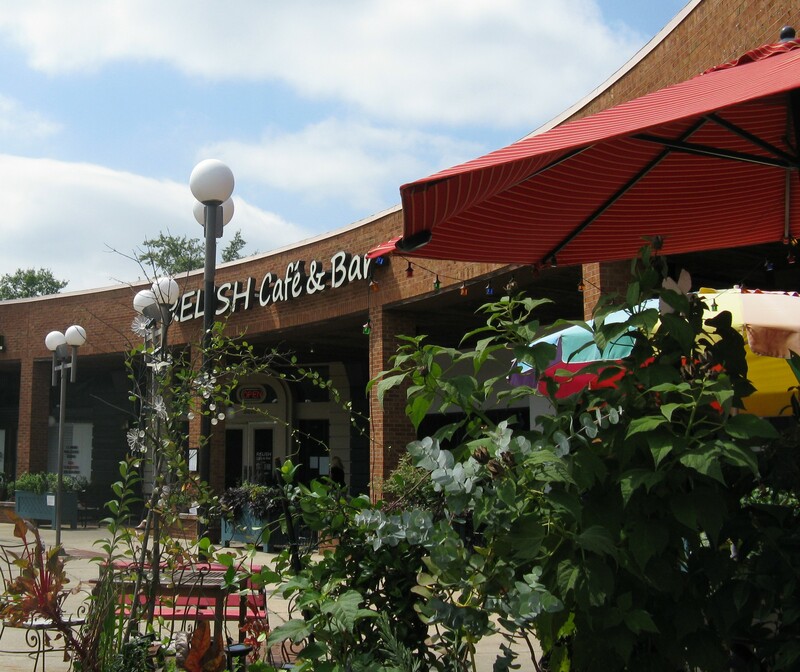 This entry was posted in Restaurant Reviews and tagged eat drink and be merry, Kel's Cafe restaurant reviews, Raleigh restaurant southern cooking, Relish Cafe & Bar Raleigh NC review. Bookmark the permalink. I think Relish has the best Cobb salad I’ve ever eaten! I get it with the sun-dried tomato vinaigrette. To die for! I might buzz you one afternoon when I’m working from home to see if you can meet for lunch, because I really, really like Relish!